Mrs. MM and I were based out of Singapore for many years starting the early 1990’s. Every time we needed a quick, fast, relatively healthy and economical meal, we either got some Hainanese Chicken Rice or some char siu (barbecued) pork sliced and served over rice, with a side dish of choy sum with oyster sauce. It became our equivalent of fast food, the Big Mac or Chicken Joy proxy. They had a cafeteria-style eatery on the second floor of the departure area of Changi airport where I indulge in a dish of char siu and coy sum, while in transit to the numerous cities I had to do business in. 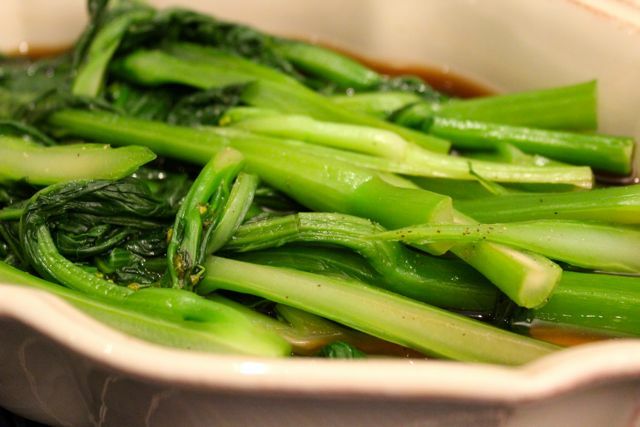 Choy sum (Brassica chinensis) has a “pale green, long, medium-size stems with rounded pale to mid-green leaves. It may show small yellow flowers at the tips of inner stems” according to The Encyclopedia of Asian Food and Cooking by Jacki Passmore. It isn’t common in local wet or weekend markets, except those catering to the Chinese community. I love choy sum and wish it were more readily available. So when I spotted a whole pile of choy sum at my Suki, Mary’s stall at the FTI market, I bought several bunches. 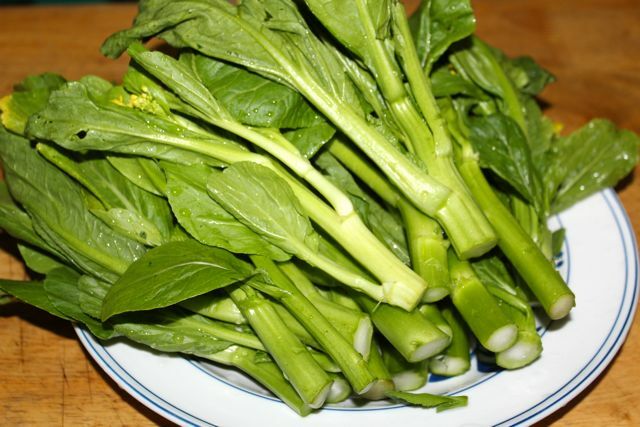 Simply wash the greens thoroughly and split the larger stems in half, lengthwise and blanche in some chicken broth just long enough to soften the stem, but still leave some bite, say a minute or so. Drain and add some oyster sauce and toss. Serve hot or warm. A little drizzle of sesame oil works as well. It is so simple, yet so satisfying. I agree, it’s a wonderful vegetable. Hard to grow here I suspect, anywhere but the cooler places in winter. Sadly all these greens tend to bolt in the warmer weather. Oh i love them simply steamed and dip in soy sauce top with fried garlics! I normally buy my choy sum from my suki in guadalupe market :-) i think they are supplying quite a number of restaurants too in Manila so they have good choice of veggies. MM, wow am waiting (after these ADS) for the Zubuchon Boneless feature at Kapuso Mo Jessica Soho now! Great one! Thanks for posting this. When we moved here in the West Coast I often visit asian markets with a lot of leafy produce and this is one of the veggies I spot there. Now after reading your post I am finally officially introduced to this vegetable. I saw you on TV tonight! :) OMG! If only there’s a Zubuchon resto in metro manila hinding hindi ako mag-aaksaya ng oras para magpabili ng Zubuchon porchetta! Viewers can’t help themselves sigurado sa pagsasalivate! One can almost taste that crunchy pork skin with you e! Nakakaloka, kulang na lang lumabas sa tv ang amoy ng Zubuchon boneless pork belly na yon! I’m sure sir MM na lalo pang dadami ang orders para sa Zubuchon porchetta simula bukas! @dlanor briones: thank you for the link! I missed this show last night by half an hour when I got home. 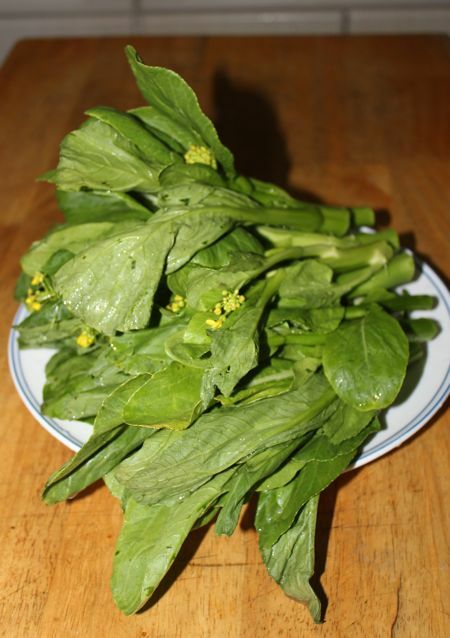 Perhaps choy sum (or choi sum) is not as popular yet is because the local farmers/growers are not as familiar with this as the other leafy green brassicas? Choi sum can grow in most areas in the Philippines. 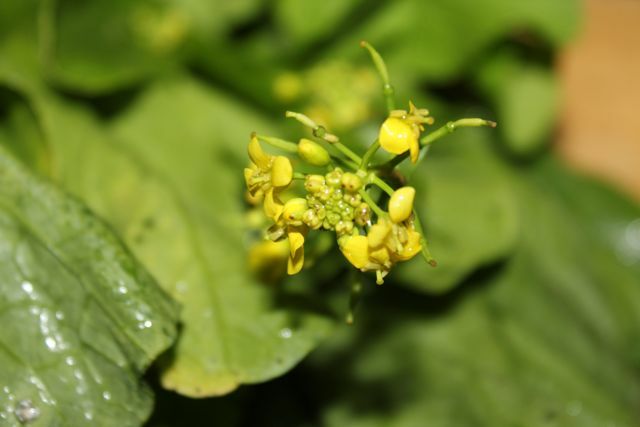 Are the Chinese flowering broccoli (kai laan) and mizuna grown and sold locally? Leafy greens always confuse me as they do all look similar. I always thought those with florets are baby kai lan and not chye sim. Chye sim are more green pechay looking. I agree that all they need is a quick blanch and some oyster sauce and fried shallots. Try to get Lee Kum Kee Seafood Soy Sauce as a small amount is good with these too. oh! so that’s what it’s called. must remember … CHOY SUM! i had this before but didn’t bother to ask what it was. it went with other vegetables in the ‘mixed vegetable’ heading. Thanks for the info. my family loves this! we have several growing in the backyard. they’re so easy to grow, but i have yet to master the growing cycle so we don’t end up with 5 kilos of choi sum one week and none the next. So choy sum is its name! I’ve seen it twice before in Farmers Market and was hesitant to get it because all the storekeeper could say about it is “Koreans buy it.” Thanks MM! FYI, CHOY SUM is the Cantonese pronunciation for this vegetable, in Hokkien (the predominant Chinese dialect in the Philippines and Singapore) this is known as CHAI SIM (or chye sim). If growing it, the ideal climate should should have temperatures from 15C-25C. Ay dami nyan dito..and seeds too. Next kong pag-uwi dyan sa Pinas, I think I will bring some packet of seeds and plant them in Quezon Province. Thanks. It’s become my go to greens here. Cheaper than kangkong! More Power to you MM and your boneless lechon. After hearing the news that Jessica Soho of GMA7	featured the boneless lechon in cebu, Me and my friends flocked to your Parkmall branch Sunday Lunch and enjoyed again the best tasting lechon ever. So juicy meat, crispy skin and that distinctive “unique” aroma and taste that you dont want to stop eating or you crave more of it. Well, that’s what all of them says….and it is really true. Good Work! You must be very busy attending to all those boxed orders like 12 or 15 boxes of ready to go boneless lechon on top of the counters that we saw. and not to mention about the “lining-up experience over there. That Sunday, the line was longer than the usual.. But it was my friends to do the line so no sweat for me. They say you haven’t been there until you do the lining up! WOW! you hit the jackpot. Keep up the good work! Is this the same as “chinese broccoli”? I think it is, they’re soo good! I just made some the other night to go with my super spicy shrimp (hilabos), I figured out we needed some greens to go with our meal to make it healthy right! :) Super quick, easy and yummy! Like what you did, I blanched them first but I put the the stems in first so they’re kinda standing up, so the stems will cook first and not to overcook the leaves…I had a bit of time to prep the sauce ahead of time. I just used water, some oyster sauce, a little bit of soy sauce, and cornstarch and mix it all up and set aside. Just heat the pan with a little bit of oil, I added minced garlic, some (frozen) grated ginger, and some chili flakes, add the oyster sauce and just let it simmer for a few minutes, add back the choy sum, turn heat off right away and add sesame oil last minute, serve right away!